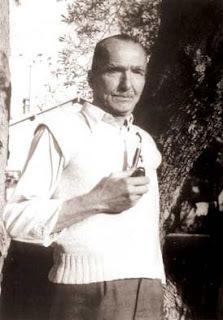 Travels in Greece has always been one of my favourite Nikos Kazantzakis’ books, in which the Cretan writer takes the opportunity of a journey through the Peloponnese to meditate on Greek past and present. It’s a melancholy work, written in the 1930s, heavily influenced by Ion Dragoumis – whose spirit, Kazantzakis says, accompanied him on the journey – and echoes Seferis’ ‘wherever I go, Greece wounds me’. No doubt, in contemporary Greece, this Dragoumian view of the Greek self as inseparable from the travails of the Greek nation, is anathema. ‘The face of Greece is a palimpsest bearing twelve successive inscriptions: Contemporary; the period of 1821; the Turkish yoke; the Frankish sway; the Byzantine; the Roman; the Hellenistic epoch; the Classic; the Dorian middle ages; the Mycenaean; the Aegean; and the Stone Age. ‘Pause on a patch of Greek earth and anguish overcomes you. It is a deep, twelve-levelled tomb, from which voices rise up calling to you. Which voice should you choose? Every voice, every spirit longs for its body; your heart is shaken, and cannot decide. ‘For a Greek, the journey through Greece is a fascinating, exhausting ordeal… For a foreigner the pilgrimage to Greece is simple, it happens without any great convulsions… But for a Greek, this pilgrimage is fraught with hopes and fears, with distress and painful comparison. Never does a clear and unencumbered thought arise, never a bloodless impression. ‘A Greek landscape does not give us… an innocent tremor of beauty. The landscape has a name, it is bound up with a memory – here we were shamed, here glorified; blood or sacred statues rise up from the soil, and all at once the landscape is transformed into rich, all-encompassing History, and the Greek pilgrim’s whole spirit is thrown into confusion.